Boston Red Sox second baseman Dustin Pedroia is headed back home to Arizona for more rehabilitation. Manager Alex Cora said Tuesday that there is no current timetable for his return, but he does expect him back this year. "I think the most important thing is for him to be healthy," Cora said. "This is not about just contributing this year. We're talking about him playing for us the rest of his career. That's the most important thing." The 34-year-old had knee surgery in October and made his season debut May 26, going 1 for 11 with two walks. He returned to the disabled list in June due to left knee inflammation. 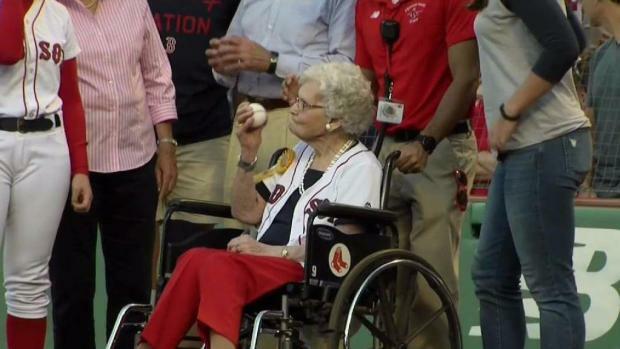 On her 100th birthday, Dottie Annis took the field at Fenway Park. "I expect him to play, yeah, but like I've been saying all along, when he comes back, it's to stay healthy and play," Cora said Tuesday. "We're not going to put a timetable on this. We'll take it day by day and go from there." In other injury news, the Red Sox announced Tuesday that infielder Marco Hernandez and catcher Christian Vazquez each had surgery. Hernandez had surgery on his left shoulder and will miss the rest of the season. Vazquez had surgery on his right pinky finger and will miss 6 to 8 weeks. The Red Sox have won seven in a row as they head toward the All-Star break with the best record in baseball. They headed into Tuesday night's game against the Texas Rangers with a 2-1/2 game lead over the New York Yankees in the AL East.